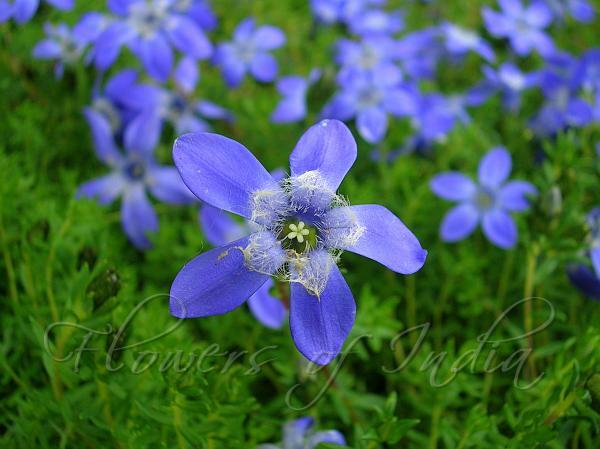 The name of this beautiful flower tells a lot about it: cyananthus = blue flower; microphyllus = small-leaved. Native to the Himalayas, this low growing perennial plant grows only 5-10 cm high. It has trailing woody, reddish stems with tiny bright green leaves. Leaves entire, dark green, narrow, elliptic-ovate, at base rounded, 5-8 mm long. Flowers are solitary, blue-violet, funnel-shaped and with narrow-obovate pointed spreading petals 1-1.5 cm long, and with tuft of white hairs within the flower-tube. Sepal tube is half as long as the flower-tube. 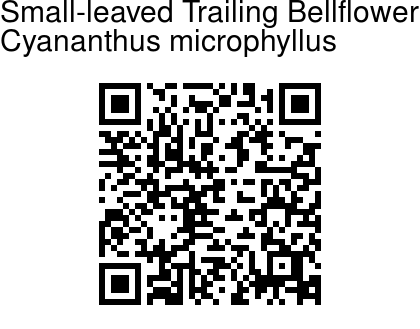 Small-leaved Trailing Bellflower is found in the Himalayas, from Uttarakhand to SE Tibet, at altitudes of 3000-4800 m.